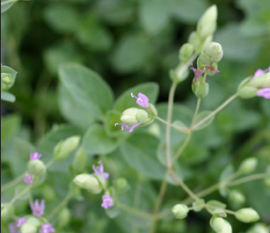 Compact oregano with small tiny, dark green leaves and striking dark blue flowers on a tall stalk. Prefers a well drained, moist sandy soil. More of a ground cover. Beautiful blooms end of May through July. Great for planting between stepping stones and hanging baskets. Flowers need to be trimmed back to encourage new growth. More of a nice ground cover for landscaping. Dark blue flowers are stunning as fresh cut and dramatic as dried arrangements.